The new products will officially be available on the MFT online store on January 10th at 9:00 pm EST (= Europe: January 11th at 3:00 am CET). Most of the supplies I used for this project are linked in the link-up tool at the bottom of this post. 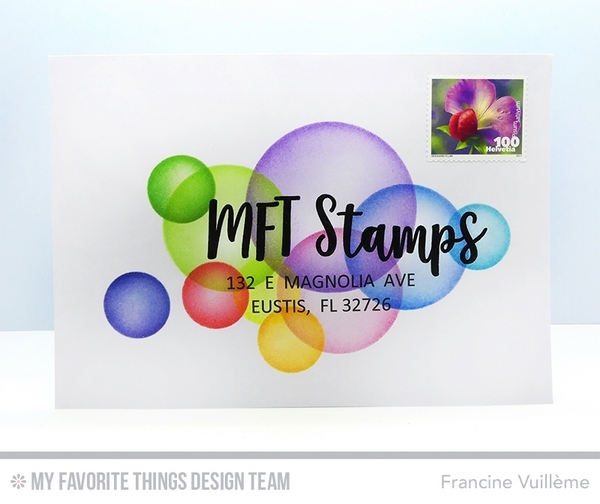 I decided to embellish an envelope to feature this fabulous stamp set. The alpha is just so perfect to write the recipient’s name on the envelope. It looks like handmade calligraphy! I stamped the letters with Black Licorice Premium dye ink. I printed out the address below the name (but you can write it by hand too) and left everything dry a little bit. I created some stencils with the Circle STAX Die-namics Set 1 and 2. I used the negative spaces only. I then sponged the circles with MFT dye inks using a blending tool: Cherry Crisp, Orange Zest, Daffodil, Sour Apple, Field Day, Lush Lagoon, Ripe Raspberry and Boysenberry. I also sponged some Distress inks. Such a fun way to send a note to your boss...I LOVE it, Francine! I love all the bright colors you chose for the circles, and how you added dimension with your inking/blending...so cool! So bright and beautiful Francine. Ohhhhhh so love this envelope! Love the stamp set and what you did with those circles. Such a fun way to dress up an envelope! 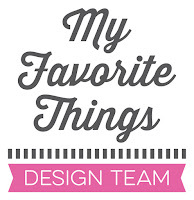 Like the fonts of the alphabet and love your background! Love the colors, the graphic circles, and the fabulous alphabet. they make a terrific envelopes. I can't belive it, is so beautiful, I love it! Brilliant use of the new stamps set! Love the background too.